Middlebury, Ind. 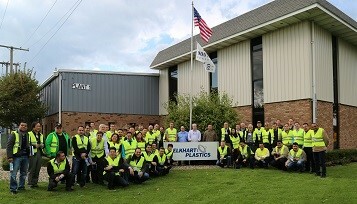 – Elkhart Plastics, Inc. is thankful to be part of such an amazing group of rotomolders! Members of the international rotomolding community visited our Middlebury, Ind., facility earlier this month as one of two stops on the 2014 Rotoplas International Rotational Molding Exposition schedule. The Rotoplas tour was also open to participants in the 2014 Rototour. We were happy to provide demonstrations of several of the facility’s rotational machines as well as some secondary processing/assembly areas and our Middlebury mold shop.